겉날개(Elytra) 는 플레이어가 글라이딩을 할 수 있는 망토 비슷한 아이템으로, 폭죽 로켓 또는 급류 마법을 부여한 삼지창을 사용하면 날 수도 있다. "elytra"는 그리스어로 날개를 보호해주는 덮개라는 뜻이다. 겉날개는 엔드 함선에서만 발견할 수 있다. 엔드함선은 대부분의 엔드 도시와 함께 생성된다. 겉날개는 셜커가 지키고 있는 액자에 들어있다. 팬텀 막을 사용하여 수리할 수도 있다. 겉날개는 흉갑 슬롯에 넣어 장착한다. 슬롯에 직접 넣어도 되고, 발사기를 사용하여 장착할 수도 있고, 단축바에 있을 경우 우클릭을 하면 장착된다. 겉날개는 기본으로 회색이지만, 겉날개를 입으면, 플레이어가 입고 있는 망토의 디자인으로 바뀐다. 겉날개를 입고 있으면, 망가졌거나 마법이 부여되었거나에 관계 없이 항상 동일한 텍스처로 나타난다. 비행을 하려면 플레이어가 떨어지는 동안, 점프키(스페이스 바)를 눌러야 한다. 비행이 활성화되면 겉날개가 새의 날개처럼 퍼진다. 이 때부터 좌우 키를 사용하여 방향을 조절할 수 있고, 위/아래를 바라보면 글라이딩 속도 및 하강 속도를 조절할 수 있다. 비행 속도는 멀리 갈수록 점점 느려진다. 위를 바라보면 속도가 훨씬 더 빨리 느려진다. 계속 위로 올라가면 잠깐 동안 고도가 상승하지만, 너무 오래하면 스톨이 발생하여 매우 빠른 속도로 떨어지게 된다. 비행 속도는 느린 낙하 상태 효과의 영향을 받는다. 가장 효율적인 비행은 하방 5.9°이다. 비행거리면으로는 약간 짧지만, 속도가 빠르다. 최고로 오래 비행할 수 있는 시간은 14도 위로 비행할 때이다. 플레이어가 아래쪽으로 글라이딩하여 속도를 올린 후 상승하면, 거의 직전의 고도까지 올라갈 수 있다. (이 방법을 사용하면 폭죽 로켓을 사용하지 않고도 멀리까지 비행할 수 있다.) 비행중에 방향을 급격하게 바꾸면 속도가 빠르게 줄어든다. 크리에이티브 모드의 경우, 점프를 누르고 있으면 위로 올라갈 수 있다. 글라이딩하다가 땅이나 벽에 빠른 속도로 부딪치지 않으면 추락 피해는 받지 않는다. 얼굴로 부딪치거나, 스톨로 추락하게 되면 추락 피해를 받는다. 겉날개를 착용하고 글라이딩하는 플레이어의 히트박스는 플레이어의 발을 중심으로 0.6블록 입방체으로 줄어든다. 참고로, 평소의 히트박스 높이는 1.8블록이다. 글라이딩을 하면 매 초당 내구도가 1씩 내려간다. 겉날개의 총 내구도는 431 이므로, 마법이 없을 경우 총 글라이딩 시간으로 7분 11초이다. 모루를 사용해 내구성 마법을 부여 하면, 비행 중 내구도 저하가 줄어들며, III 레벨까지 부여했을 때 내구도가 약 4초당 1씩 내려간다. 플레이어가 폭죽 로켓을 손에 들고 글라이딩을 하면서, 폭죽 로켓을 우클릭하면 글라이딩 속도가 빨라지면서 플레이어가 날 수 있게 된다. 단, 로켓에 폭죽 탄약이 탑재되어 있을 경우엔 플레이어에게 7 ( )의 피해를 입힌다. 속도 증강의 기간 및 강도는 폭죽 로켓의 비행 시간에 따라 달라진다. 플레이어가 급류 마법을 부여한 삼지창이 있을 경우, 삼지창을 사용하면 플레이어가 앞으로 돌진하면서 날 수 있게된다. 단, 이렇게 되려면 물 속에 서있거나, 비 또는 뇌우 중에만 가능하다. 내구도가 1이 되면, 수리를 해야만 사용할 수 있다. 더 이상 작동하지 않기 때문에, 완전히 망가져 사라지는 일은 없다. "망가진" 겉날개는 플레이어에겐 똑같이 보이지만, 찟어진 텍스처로 나타나게 된다. 숫돌에서 망가진 겉날개 두개를 합치거나‌[차기 버전용: JE 1.14], 수선 마법을 사용하거나, 모루에 팬텀 막을 사용해서 수리할 수 있다. 하나의 재료당 내구도를 108 회복 시키므로, 완전히 수리하려면 4개가 필요하다. 겉날개에 부여할 수 있는 마법은 다음과 같다. 모두 모루를 이용해서 부여해야 한다. 참고: 가시 저주도 겉날개에 부여할 수 있지만, 명령어를 사용해야 한다. Tommaso Checchi tweets that Jeb is working on a secret feature for Minecraft PC, saying "it's like Mario 64". Jeb tweets a animated GIF revealing a player gliding around an end city. Elytra have a dragon-wing texture. Jeb tweets an image of folded wings, which replace the cape the player is wearing. Jeb tweets another animated GIF of his character with Mojang-themed elytra, gliding along a river through a taiga forest. Elytra was repaired with leather when using anvil. Elytra will now spread slightly when the player crouches. The player can now take damage from gliding into walls, and crashing into a wall now has its own death message. When flying with elytra, players are only 0.6 blocks tall. They therefore can now fit through 1-block gaps while gliding. The player is now no longer able to go higher than the starting point of the glide. The player's point of view will now shift while gliding. 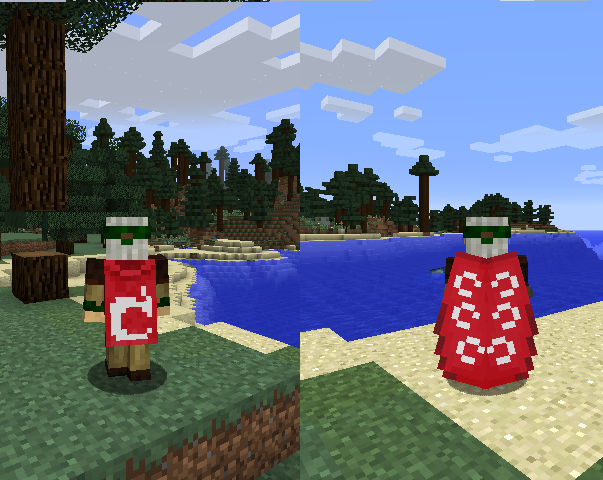 Elytra will now recognize the player's cape and adopt a different elytra cape design for every official cape (see Gallery). In addition, Jeb is working on a feature that will allow players to change the elytra design like regular player skins. Elytra are now activated by jumping mid-air. The player no longer glides automatically when falling. The cape option in the options menu will now also disable custom elytra textures. Elytra can now be placed on armor stands, just like any other chestplate. Elytra is now visible on zombies, skeletons, and armor stands. Elytra now have their own sound when equipped. Elytra can now be propelled through the air by using firework rockets. Prior to The Flattening, this item's numeral ID was 443. Elytra will now require phantom membrane to be repaired, instead of leather. Added elytra. In-game, they are known as elytra wings. Renamed Elytra Wings to Elytra. Elytra can now be repaired in an anvil using phantom membrane, instead of leather. Elytra is now repaired on the anvil using phantom membrane instead of leather. “겉날개”에 관련된 문제점은 이슈 트래커에서 관리된다. 그곳에서 문제점을 보고하면 된다. 최초의 겉날개 이미지. Jeb의 트윗. 클릭하면 플레이됨. 접은 겉날개(오른쪽). 사용자가 입은 망토와 닮았다. 공식 망토에 맞춘 겉날개 디자인. Jeb_이 Reddit에 올림. 현실에서 겉날개(Elytra)는 딱정벌레나 집게벌레들이 실제로 나는데 사용되는 날개를 감싸는 딱딱한 부분으로서, 나는데는 사용되지 않는다. 사다리에서 글라이딩하는 것도 가능하다. 먼저 ⇧ Shift를 누른 뒤 space를 누르면 된다. 이렇게 하면 플레이어가 떨어지고 수직 회전에 의해 속도가 결정된다. 즉, 플레이어가 사다리에서 매우 빠르게 내려올 수 있지만, 땅에 닿을 때 너무 빠르면 치명적인 추락 피해를 입는다. 폭죽 로켓을 사용하면 하강 속도를 높일 수 있다. 플레이어가 겉날개를 착용한 채 깊은 물 속으로 글라이딩하면, 애니메이션이 정지하지 않아서 더 나은 수영 애니메이션처럼 보인다. 하지만 플레이어가 땅에 닿으면 애니메이션이 정지한다. 아울러 물속에서도 폭죽 로켓을 사용할 수 있지만, 물의 저항효과로 속도 증가는 줄어든다. 물속 수영에 유용하다. 명렁어를 사용하여 겉낼개를 몹에게 장착 시킬 수도 있다. 일부 몹에는 적용되지 않는다. 대부분의 몹은 비행경로 3가지중 하나를 따르게 되며(제어하지는 못한다) 착륙한 뒤 자신의 AI로 되돌아간다. 4J Studios에서는 콘솔 에디션에 겉날개가 처음 소개 되었을 때, 겉날개 중심의 튜토리얼 지도를 생성했다. 이 지도의 주제는 "마인크래프트 숭배자의 고대 문명의 잔해"로서 새로운 증각 지형 생성을 선보였다. 이 맵은 여기의 비하인드 씬에서 볼 수 있다. 겉날개와 느린 낙하 상태 효과가 모두 있을 경우, 점프을 누르면 약간 위로 올라간다. 이를 이용해 폭죽 로켓이나 급류 마법 없이도 멀리까지 갈 수 있다. ↑ "Elytra Model 15w41b" – Imgur, October 10, 2015. 이 문서는 2019년 4월 14일 (일) 10:38에 마지막으로 편집되었습니다.